This sight is for wholesale only. For orders under 10 pounds please click here for retail site. As a wholesale Alaska Snow Crab seafood supplier, we ship fresh frozen Alaskan Snow Crab legs worldwide! Request a wholesale quote for fresh Snow Crab! 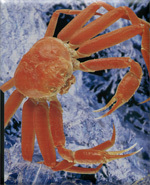 English : Snow crab, Tanner crab. French : Crabe des neiges.